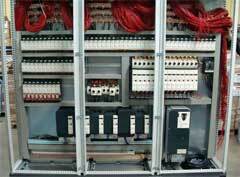 Control of the 80 motors for a waste sorting centre, this function is provided by 3 electric cabinets. This third cabinet is composed of 80 motor starters for waste sorting process management. Open steel cabinet plus base.